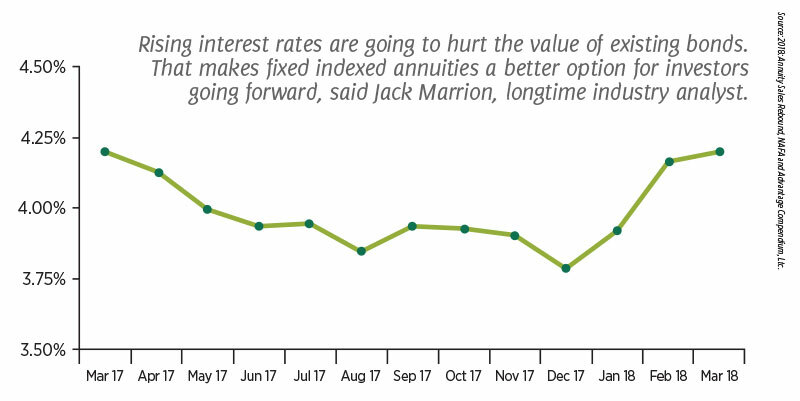 Annuities have been stumbling after years of accelerating growth, but Jack Marrion has a simple reason why that pace might pick up again — agents and advisors are getting back to selling. The biggest all-clear sign has been the pushing back of the Department of Labor’s fiduciary rule, particularly the wholesale rejection of the rule on March 15 by the Fifth Circuit Court of Appeals in New Orleans. Regulation rulemaking was the main culprit for the slump, but economic and market factors contributed. 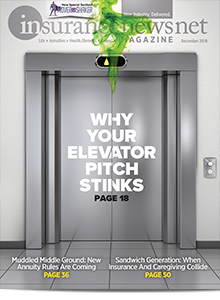 Distribution channels were disrupted, and agents shied away from annuities. » General market conditions. Simply stated, the conditions for selling annuities vastly improved. The court’s decision to kill the DOL rule is one example. » The RIA potential. Annuity companies have long aspired to break into the registered investment advisor market. The timing might be right for it to finally happen, analysts say. 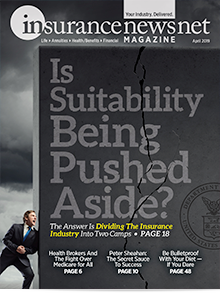 Due to a variety of pressures, annuities have struggled lately to maintain their foothold even in the insurance world. In 2017, total annuity sales were $203.5 billion, a decline of 8 percent from the prior year, according to LIMRA Secure Retirement Institute. The lingering threat of regulation is the most significant factor, but the threat might be dissipating. The DOL fiduciary rule took partial effect in June 2017 but was tossed out by a New Orleans appeals court March 15. The federal government did not appeal by the May 1 deadline, and the Fifth Circuit denied separate appeals by AARP and three states (New York, California and Oregon). 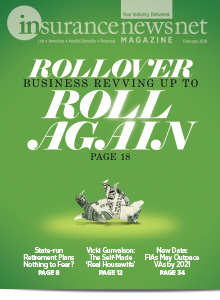 Barring an unlikely last-minute reversal by either the court or the government, the DOL rule is dead. Rising interest rates. The Federal Reserve hiked rates to 1.75 percent last month, the highest since 2008. Chairman Jerome Powell projects a total of three rate hikes this year. Market volatility. Factors such as trade wars and international conflicts are contributing to instability in the markets. Bully pulpit. A phrase coined by President Theodore Roosevelt in 1900 is an apt description for the impact President Donald J. Trump is having. The current stock market “bull” run stands at 110 months. By midsummer, it could match the longest bull market since World War II, Marrion noted. At some point, it has to end. And that makes investors more nervous with each succeeding month, Marrion said. Many of them remember the 2008-09 crash, when many Americans lost a sizable portion of their retirement savings. Sales of fixed annuities — a product aimed at offering growth with protection from any losses — surged following the 2008-09 market crash. FIA sales could logically rise again. Otherwise, bond returns have been hurt by rising interest rates. A $100,000 U.S. Treasury bond purchased in August 2016 would be worth just $86,000 if sold today, Marrion noted. “We have a rising interest rate market, and in Finance 101 you learn that when interest rates go up, the value of existing bonds goes down,” he added. The Fed could hike rates another 2 to 3 percent in the next couple of years. 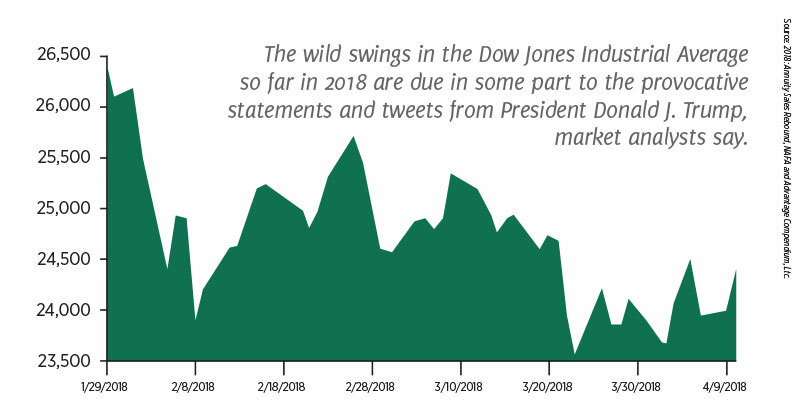 The wild-card factor comes from the West Wing, where a tweet by President Donald J. Trump can send the stock market into a frantic sell-off. We’ve seen it happen several times already this year. Trump’s use of the bully pulpit will likely continue to have implications for the markets, Marrion said. Meanwhile, efforts to establish some form of a best-interest standard that tightens regulation of annuity sales is ongoing. The Securities and Exchange Commission has a rule based on additional and clearer disclosures. The National Association of Insurance Commissioners is working on a best-interest model law for annuity transactions. Theoretically, each state would then adopt that law, although the 50-state disparity of opinions makes that a dicey goal. The bottom line is there will likely be tougher regulation of annuities to come, but signs are it won’t be restrictive enough to inhibit stronger sales. Financial advisors have shied away from annuities. That was an unfortunate development that limits retirement planning to this day, said Jamie Hopkins, Retirement Income Program co-director at The American College. 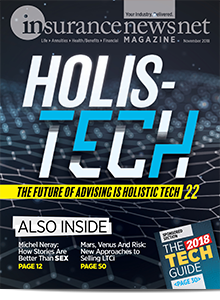 As regulation of agents and advisors appears heading to a more consistent standard for all, it will affect the marketing and sales of annuities. The task for annuity companies is to win over RIAs. So far, they are embracing the challenge. 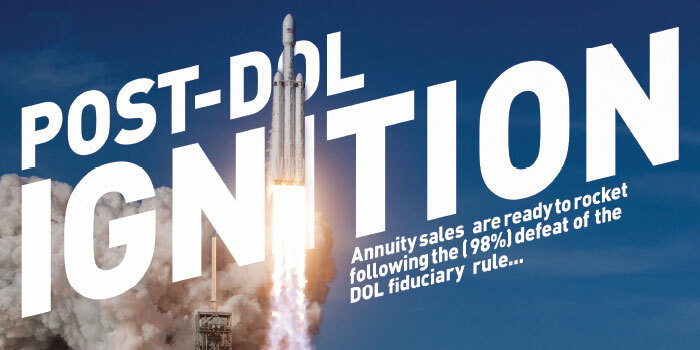 As the DOL rule crept closer to reality, with its punitive liability attached to commission-based sales of variable and fixed indexed annuities, providers turned to fee-based concepts. Even though the DOL rule is likely to disappear, the fee-based annuities are not. Insurance companies including Pacific Life, Great American Life and Lincoln Financial Group have launched fee-based variable and fixed-indexed annuities over the past year. Rather than charge an upfront commission, the advisor is paid in the form of annual fees on the assets. The potential to appeal to the advisory side is too great to turn back. But to date, market penetration has proven elusive. Fee-based variable and indexed annuities, considered critical to attracting RIAs, finished 2017 with sales of $2.3 billion, or about 3.1 percent of all variable and indexed annuity sales, data show. Fee-based variable annuity sales in 2017 reached $2.2 billion, but that was still only about 2.7 percent of all VA sales last year, according to preliminary data released by LIMRA Secure Retirement Institute. Fee-based indexed annuities finished with sales of $138 million, just 0.4 percent of all indexed annuity sales last year. Still, while these numbers are low, they are rising. Speaking during recent earnings calls, insurance company executives say they are full speed ahead on fee-based product lines. “While in the early stages, sales momentum is growing in our variable annuity business as product portfolio expansion enables us to take market share now while fee-based products, such as Core Income, will build over time and help support long-term growth,” said Dennis Glass, president and CEO of Lincoln. The biggest issue is sorting out the complex compensation issues, Hopkins said. The problem is that many of the early fee-based annuity product designs are ill-suited to any fair compensation arrangement, analysts say. A separate potential trend that could bridge the compensation gap is the “hybrid” advisor, who accepts both commissions under the insurance model and fees as a fiduciary. Robert Klein is a hybrid financial advisor focused on retirement planning in Newport Beach, Calif. He turned to fixed annuities after seeing so many investors lose big chunks of their retirement portfolio in the 2008-09 market crash. Fixed annuities allow clients to make gains in the market while offering complete downside protection. 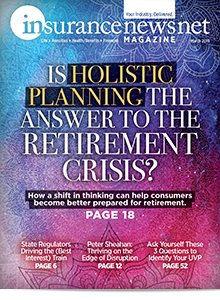 “If you’re specializing in planning, especially retirement income planning, you’re shortchanging clients if you don’t have a working knowledge of what annuities can do,” said Klein, founder of the Retirement Income Center. There needs to be “more education at the RIA level,” Klein said. Traditional advisors can make annuities work on a commission basis if they establish a separate department focused on retirement income planning, he added. Hybrid advising might be a trend that picks up momentum as regulation takes shape. It might already be happening, according to Cerulli Research data. Hybrid assets rose in market share from 6.2 percent in 2006 to 8.8 percent in 2016, the firm found. The key might be changing perceptions. For many in the advisory world, annuities are an anathema treated with a scorn personified by Ken Fisher’s career-defining “I hate annuities” spiel. DPL Financial Partners talked to 118 RIAs and found that 70 percent consider insurance “an important component of a holistic financial plan.” Yet, just 25 percent offer clients the full range of insurance products. In other words, they shy away from annuities. Some of the skepticism is justified. But the days of wild surrender charges and other high fees are probably gone for good. 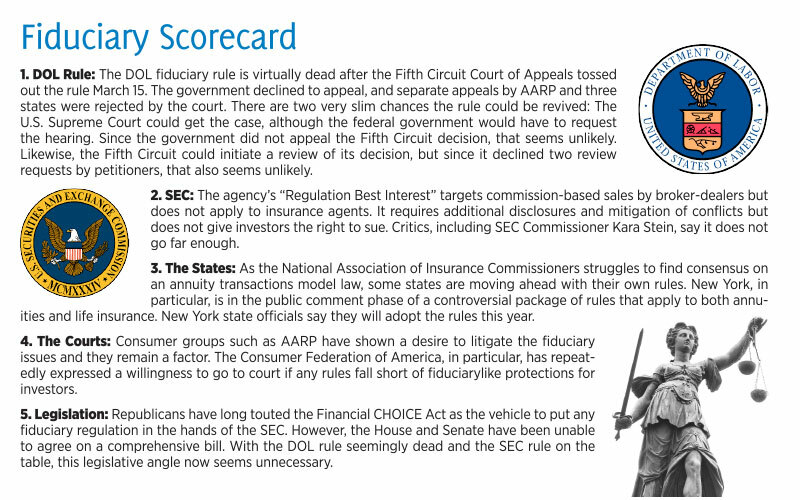 Fiduciary and best-interest regulatory scrutiny is coming from state as well as federal regulators. Many retirement experts expect annuities to continue to gain in stature from an unlikely partner: the federal government. Even as DOL bureaucrats sought to attach legal liability to the sale of variable and fixed indexed annuities, other Obama administration officials were encouraging the use of annuities in retirement planning. Even though Obama is gone from the Beltway scene, the support for annuities is now bipartisan and has spread to Congress. In March, Senate Finance Committee Chairman Orrin Hatch, R-Utah, introduced the Retirement Enhancement Savings Act of 2018 with ranking member Sen. Ron Wyden, R-Ore. 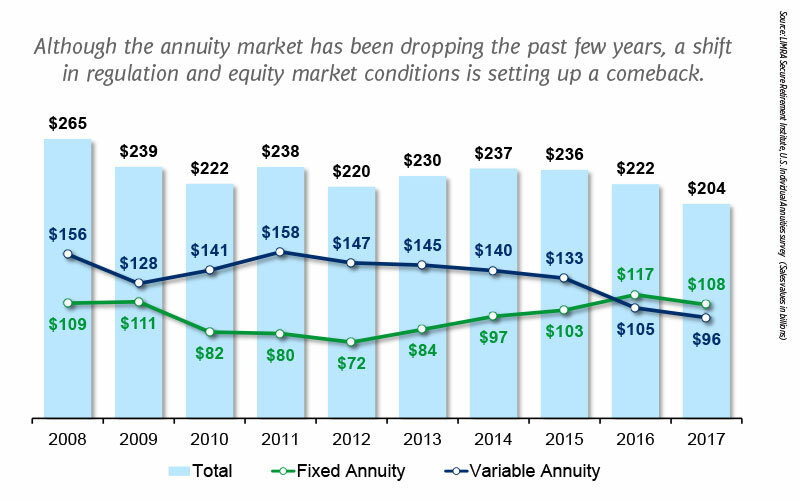 The Obama administration Treasury Department boosted annuities in 2014 by authorizing qualified longevity annuity contracts (QLACs). The Treasury guidance permits QLAC owners to defer required minimum distributions to as late as age 85. Klein has sold a good number of QLACs over the past 3-1/2 years, and every sale has been to a high-net-worth client. “The primary purpose of each sale has been to provide sustainable lifetime income later in life,” he said. The subject of QLACs is coming up more frequently with clients, Klein said, and he has seen an uptick in interest in QLACs, a special kind of deferred income annuity. In 2016, 32.1 percent of income annuity quotes were for DIAs with a start date of 13 months or more, and in 2015, only 28.3 percent of quotes were for DIAs with the delayed start date, CANNEX reported. It’s no secret why governments and analysts are linking annuities to retirement savings, despite their sometimes spotty reputation. Americans cannot rely on Social Security alone. Americans 40 to 45 years old report a median retirement account balance of $14,500, according to the Schwartz Center for Economic Policy Analysis. That is less than 4 percent of what the median-income worker will require in savings to meet his or her retirement needs, Harvard Business Review reported. Meanwhile, Social Security offers a persistently declining percentage of the required retirement income. For a median-income worker, Social Security minus Medicare premiums today covers about 29 percent of their preretirement income, down from 40 percent two decades ago, HBR added. The responsible financial advisor is serving the client well if he or she strongly considers a fixed indexed annuity, said Roger G. Ibbotson, emeritus professor of finance at the Yale School of Management. He bases his affinity for FIAs on the faltering bond market. While bond yields recently hit 3 percent for the first time in four years, that is well short of the 7 and 8 percent and even double-digit bond yields of the 1990s. A $100,000 U.S. Treasury bond purchased in August 2016 would be worth just $86,000 if sold today. Of course, there is a downside, and the product fits specific client profiles best. Principal protection is the key for this type of client. You de-risk the portfolio nearing retirement, but FIAs still give the client some chance to participate in market returns, he explained. The important thing with fee-based annuities is what they can accomplish for advisors and clients, Ibbotson said. “I recognize there are some problems with the industry, but I think they’re moving in the direction of trying to tailor-make products that actually meet the needs of investors,” he said. 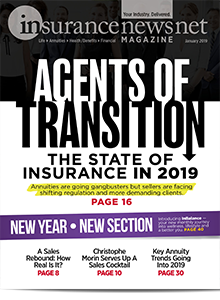 Taken together, perception, regulation, product evolution and market conditions are all trending in the direction of annuities becoming a stronger part of the RIA product line. “RIAs are now talking about annuities,” said Jason Wellmann, senior vice president of Life Insurance Sales for Allianz Life. The distribution channels are changing along with the product designs as the industry responds to regulation and changing demographics. In addition to the growth of fee-based annuities, an August 2017 study found that products are hitting the market faster, there is more transparency in how agents are paid and efficiency is improving in the administration of annuities. While some insurers are doubling down on their career force, said consultant Chris Eberly, many others are looking for RIAs through which to distribute annuity products. Insurers are attracted to RIAs because they are growing rapidly and are more profitable and capturing more assets faster than other channels.